Jerusalem, Masada, The Dead Sea, Bethlehen, Wadi Rum, Petra, Tel Aviv, and more! 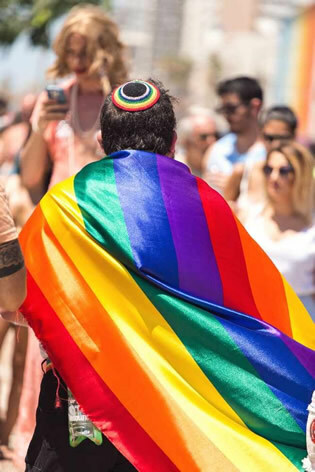 Happy Gay Travel & Source Events invites you to experience the magic of Petra, the history of Jerusalem and the fun of Tel Aviv Gay Pride 2019. Walk in the footsteps of history! Explore one of the world’s greatest wonders! Arrival in Tel Aviv. Meeting at Ben Gurion airport and transfer to Jerusalem hotel. 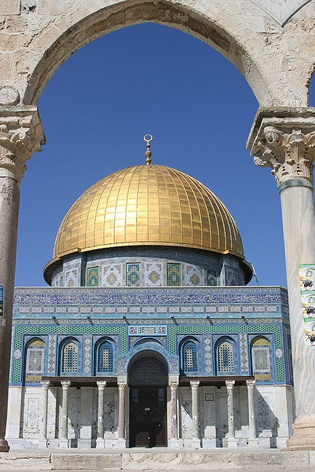 Touring the Old City of Jerusalem – Explore the old city that is home to 3 great religions. Our appreciation of the Old City of Jerusalem begins as we enter through the city at the Jaffa Gate. While admiring the amazing architecture of the city walls, we can pay our respects in front of the two almost forgotten tombs. Walt past the Citadel of David through the Armenian Quarter and into the Jewish Quarter. 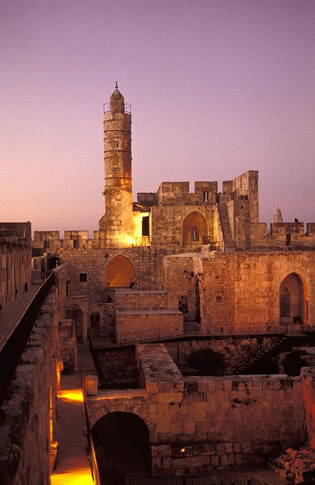 Visit the Western Wall and the Southern Wall excavations. On to the Broad Wall and the Cardo, the shopping street of Jerusalem 2000 years ago. 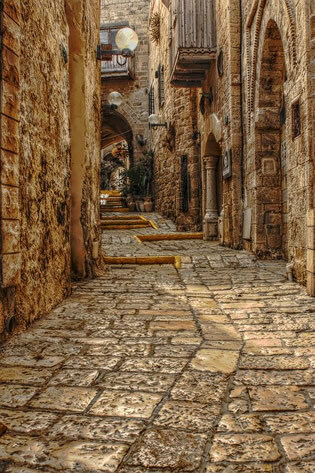 Walk through the Rabbinical Tunnel to the Via Dolorosa and the Church of the Holy Sepulchre in the Christian Quarter. No visit to the Old City would be complete without testing your negotiating skills in the marketplace. 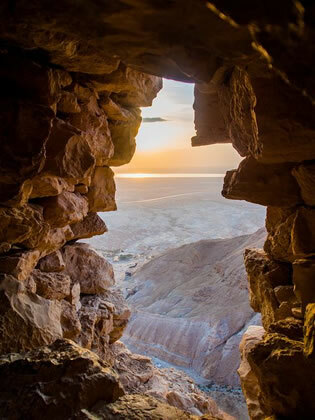 Touring to Masada and the Dead Sea – An exciting day awaits you as we drive through the Judean desert towards the shores of the Dead Sea. From here, we continue to Masada, the last stronghold in the zealots battle against the Roman Empire. Ascend to the top via the new cable car. After a tour of this mountaintop fortress, we proceed to a resort for lunch an afternoon of spa activities and floating in the world famous rejuvenating waters. Yad Vashem (Holocaust Museum), Bethlehem. 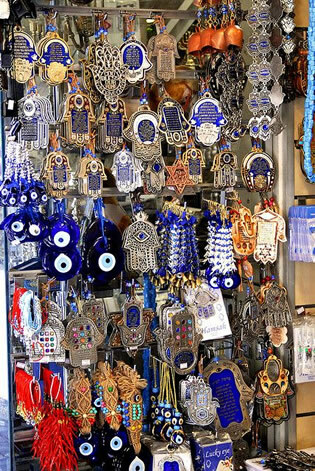 Visit at the Machena Yehuda marketplace. 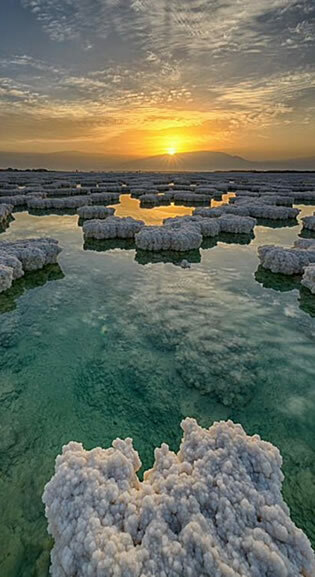 Pack overnight bag for Jordan (main luggage will be brought to your Tel Aviv hotel) Morning – Proceed to airport for late morning flight to Eilat and Transfer to Arava / Rabin border crossing. Drive to the spectacular Arabian desert of Wadi Rum, a valley of multicolored sands, where Lawrence of Arabia actually fought and the Martian was filmed. 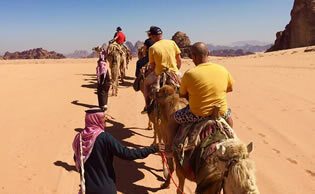 Enjoy a 4×4 ride into the desert and the option of a camel ride. After breakfast, proceed to Petra. 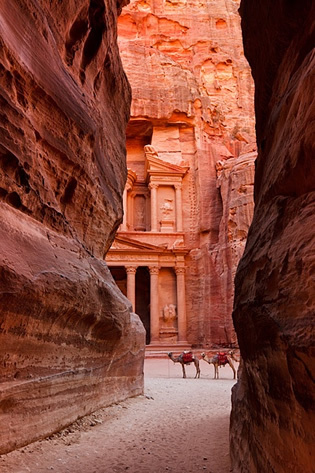 This spectacular sandstone city of Petra was built in the 3rd century B.C. by the Nabataeans, who carved palaces, temples, tombs, storerooms and stables from the standstone cliffs. From here, they commanded the trade routes from Damascus to Arabia, and great spice, silk and slave caravans. Enjoy Petra by night, with extraordinary experience of seeing Petra lit by thousands of candles. Overnight: Mövenpick Resort Petra, Petra. 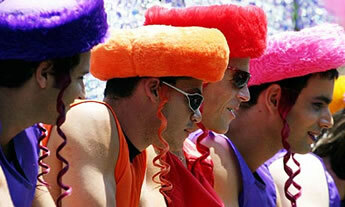 Orientation tour of Tel Aviv – We’ll start off with a tour along Tel Aviv’s coastline to Jaffa. Visit the artists’ quarter and Jaffa’s ancient flea market. Passing the renovated Turkish train station, proceed to Neve Tsedek, Tel Aviv’s first neighborhood. On to Rothschild Blvd where there are over 5000 Bauhaus buildings, the largest number in any one city in the world; a fact that led UNESCO to recognize it as a “World Heritage Site”. Tel Aviv is also known as, the “White City”, named so in account of the bright colors of the building style: white, off-white, light yellow. Overnight: Carlton Hotel, Tel Aviv. 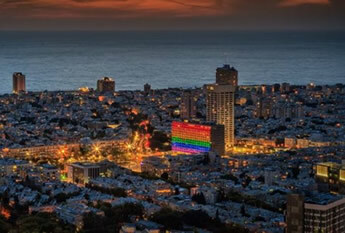 Tel Aviv Gay Pride Activities all day – Now it’s time to enjoy all of the Tel Aviv Pride Festivities, including the parade, beach party, and international events. Leisure day in Tel Aviv or Optional tour to the Galilee (Nazareth, Sea of Galilee, Capernaum, Mount of Beatitudes. Departure transfers to Tel Aviv Ben Gurion Airport. Get the celebrity treatment with world-class service at Mamilla Hotel - The Leading Hotels of the World. Mamilla Hotel - The Leading Hotels of the World features a panoramic rooftop terrace overlooking Jerusalem's Old City. This stylish 5-star hotel was designed by architect Piero Lissoni and is 10 minutes' walk from Jaffa Gate. The hotel offers a choice of restaurants, including the trendy Mirror Bar with live music and the seasonal brasserie with city views. Mamilla Café restaurant serves local specialities. Rooms at Hotel Mamilla are equipped with LCD TV, pure Egyptian cotton bed linen and modern-style décor. Some bathrooms feature a transparent glass wall that can be switched on and off. The modern Akasha Wellness Centre includes a spa and an indoor swimming pool. A sauna, fitness room and massages are also available on site. Set within the Mamilla shopping area, the property is a 20-minute walk from the Western Wall, while the Church of the Holy Sepulcher is 750 metres away. Experience world-class service at Movenpick Resort Petra. Featuring free Wi-Fi, the 5-star Movenpick Resort Petra is located directly at the entrance to the ancient city of Petra. The hotel's rooftop garden terrace offers views of the hills. Guests can workout in the well-equipped fitness centre or enjoy a cocktail in the hotel's stately lobby. The centre of Wadi Musa nearby and offers many restaurants and shops. Get the celebrity treatment with world-class service at Carlton Tel Aviv Hotel. Set directly on Tel Aviv's Marina, Hotel Carlton features a rooftop terrace with pool and views of the sea. Rooms have a private balcony, overlooking the sea or the city. Carlton Tel Aviv is a great choice for your beach stay in Tel Aviv. The outdoor pool provides fun for everyone, while guests in the mood for pampering can indulge in spa services. Dining choices include 2 restaurants and the pool bar is a great place to grab a cold drink. There's a marina and a rooftop terrace, and rooms at this luxurious hotel offer balconies and 24-hour room service and free wifi. • Private transfers and tours in modern, A/C vehicles with professional guides. • Bottled water included during tours. • Non-US Passport holders may be required to secure a visa. • Arrival and Departure Airport: Tel Aviv (TLV) Ben Gurion Airport.